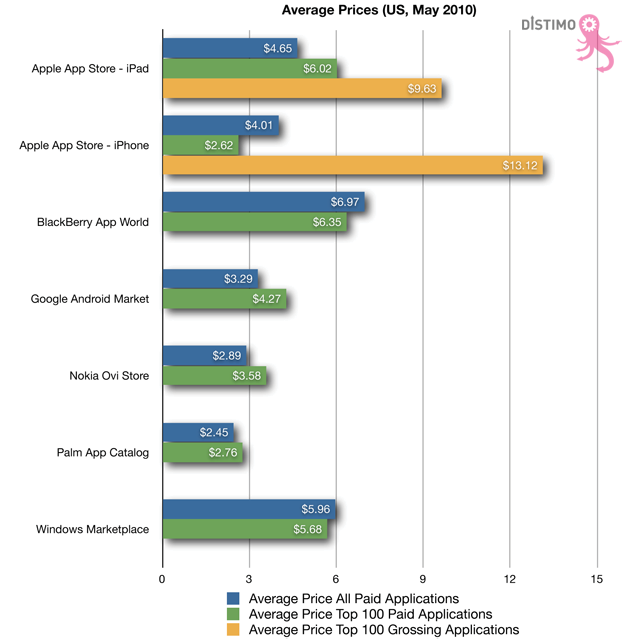 App store analytics provider Distimo last week published its report for June 2010, and zoomed in on the pricing of mobile applications across a variety of platforms once more. The startup found that more than half of mobile apps are priced below or equal to $2 in Android Market, Apple’s App Store for iPhone and iPad, Nokia’s Ovi Store and Palm’s App Catalog. The exceptions to the rule: BlackBerry App World (which doesn’t allow apps priced below $2.99) and Windows Marketplace for Mobile. The latter also boasts the smallest share of free applications for all stores researched (22% to be exact), and notably, five out of the ten most popular free apps in Windows Marketplace for Mobile are actually published by Microsoft. Android Market sticks out with a 57% share of free applications, way more than what the other stores average. Most of them clearly circle around 25% free vs 75% paid, according to Distimo’s research findings. In fact, the only other app store with a share of free apps larger than 1/3 is Palm’s App Catalog. Distimo points out that while Android Market is available in some 46 countries, users in only 13 of those are able to download paid apps, while developers from only 9 countries can distribute them in Android Market (much to the dismay of developers and users around the world). As mentioned earlier, Distimo found that more than 50% of apps get priced below or equal to $2.00 in most stores. Zooming in on the different App Store versions, Distimo’s research shows that the percentage of applications priced $0.99 ($0 – $1) is much higher in the App Store for iPhone than in the App Store for iPad. The percentage of applications priced $1.99 ($1 – $2) is similar between these two stores, while the percentage of applications priced higher than $3.00 and below or equal to $10.00 is higher in the Apple App Store for iPad than in the Apple App Store for iPhone. The average price of all paid applications and the 100 most popular paid applications in the Apple App Store for iPad ($4.65) is higher than in the Apple App Store for iPhone ($4.01). However, the average price of the 100 top grossing applications is higher on the Apple App Store for iPhone.